Several news outlets are reporting new statements by Iraqi Foreign Minister Hoshyar Zebari reaffirming Iraq's commitment to honoring its international obligations to Kuwait - including the return of Kuwaiti national archives seized in Saddam's 1990 invasion - in the context of a visit by the U.N. high-level Coordinator overseeing the issue, Ambassador Gennady Tarasov. The interesting, and slightly ambiguous, aspect of the statement is that Zebari reportedly noted that "Iraq sent several trucks to Kuwait containing national archives and properties, and would continue exerting efforts to locating the rest of the property." Another account describes the same statement as that "Iraq handed to Kuwait, in the presence of the UN Coordinator, batches of the Kuwaiti archive and possessions." It is unclear which return of Kuwaiti archives Zebari is referencing. If, however, Zebari means the Oct. 2002 return of 425 boxes and 1,158 bags of documents and archives to Kuwait (which I discussed here at #4 and which is described in extensive detail in this U.N. Secretary General report at paras. 36-75) it would be an interesting development in Iraq's advocacy on the issue, which has not relied on the Saddam-era return. Kuwait earlier dismissed the 2002 return as containing simply "routine papers." The other possibility is that Zebari could be referring to a far more recent, but far less significant, return of Kuwaiti property. 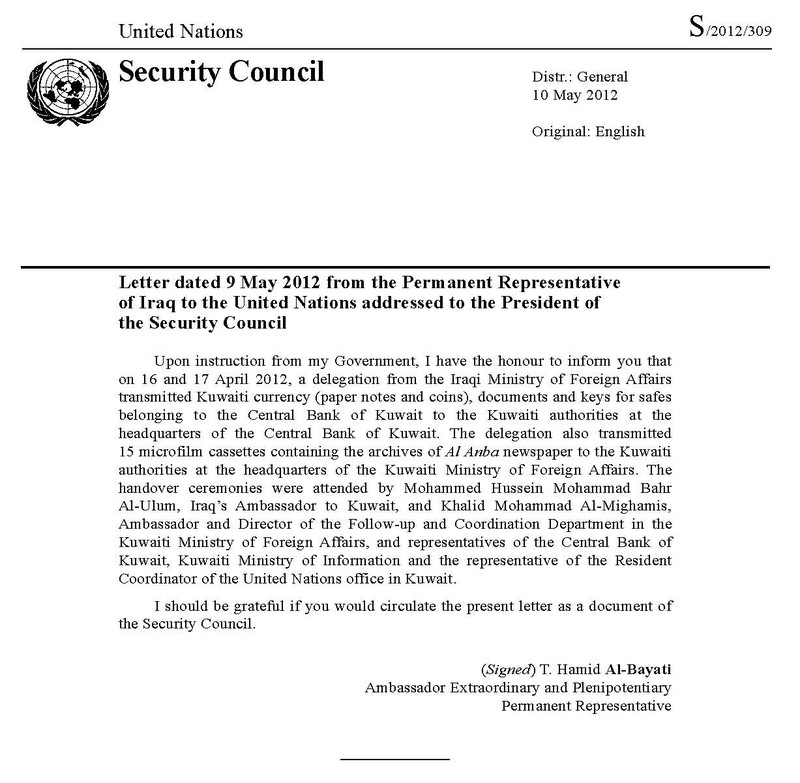 Earlier this month, the U.N. Security Council circulated a new letter from Iraq's U.N. delegation noting that Iraq recently returned Kuwaiti currency, keys to the Central Bank of Kuwait, and "15 microfilm cassettes containing the archives of Al Anba newspaper" (which could be added to the 136 microfilm cassettes of the official archive of Kuwait Today returned late last year).